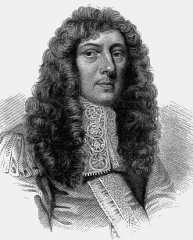 John Aubrey was an English antiquary and miscellaneous writer. He was born in Kingston, Wiltshire, and educated at Trinity College, Oxford. His most famous work is “Lives of Eminent Men”, which was not published, however, until 1823. He also wrote “Miscellanies” (1696), a collection of stories and folklore, the “Natural History of Wiltshire” (edited by John Britton, 1847), and a “Perambulation of Surrey”. His most important contribution to the study of British antiquities, the lengthy and discursive “Monumenta Britannica”, remains in manuscript. A scheme was afoot in 1692 to publish the manuscript and a prospectus and a specimen page were issued in 1693, but nothing more came of the project. It contains the results of Aubry’s field-work at Avebury and Stonehenge and notes on many other ancient sites, including Wayland’s Smithy. Apparently the original title of the manuscript was to be “Templa Druidum”. It was Aubrey who, in 1648, at the age of 22, while out hunting with some friends near Avebury in Wiltshire, recognized in the earthworks and great stones placed about the landscape in and about the village a great prehistoric temple. In the following century, William Stukeley was to develop the claim that Avebury was as an ancient cult centre of the Druids. In addition to his ‘discovery’ of the Avebury complex, Aubrey is also remembered for his inclusion in a plan of Stonehenge in his “Monumenta Britannica” of a series of slight depressions immediately inside the enclosing earthwork. Curiously, Stukeley does not record them in his painstaking examination of the site, and it was not until excavations undertaken in 1921-25 by the Society of Antiquaries that they were found to be holes cut in the chalk to hold timber uprights. A total of 56 holes were discovered and named the Aubrey holes in honour of John Aubrey’s observation. These holes are now recognized as belonging to the first phase of the monument’s construction.